Suranaree University of Technology (SUT) is currently receiving applications for its SUT-Ph.D. 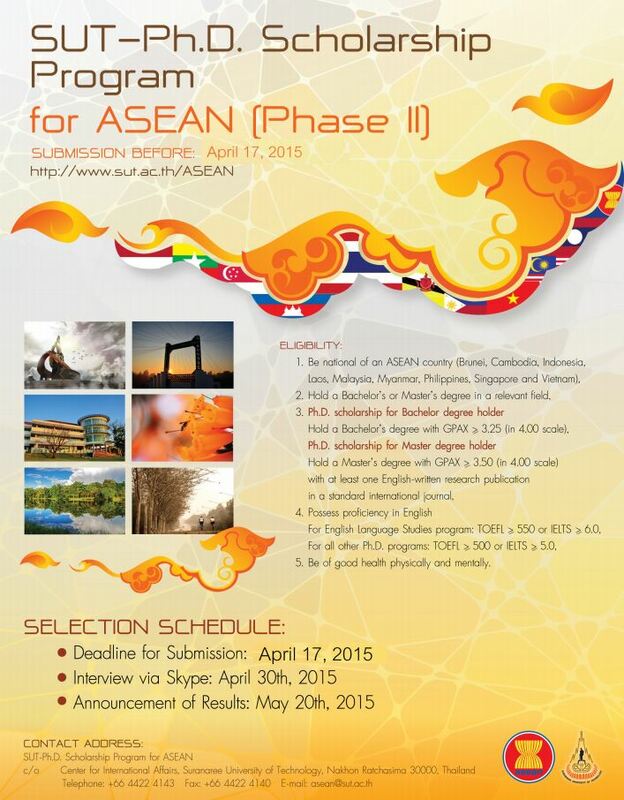 Scholarship for ASEAN (Phase II) for the year 2015. This scholarship was first established in 2011 to mark the creation of the ASEAN Economic Community as well as His Majesty the King’s 84th birthday. It aims to attract outstanding students from the ASEAN member countries to pursue Ph.D. studies at Suranaree University of Technology, one of the leading National Research Universities of Thailand. The scholarship grants a total amount of 960,000 Baht (approx. 30,000 USD) over a period of three years to a candidate holding a Master’s degree, and of 1,200,000 Baht (approx. 37,500 USD) over a period of five years to a candidate holding a Bachelor’s degree, respectively. Nine scholarships will be awarded for the academic year 2015, which commences July 13, 2015. We wish to inform you that this year’s deadline for application submission has been extended to 17th April, 2015. Further details on the scholarship and application forms can be found at http://www.sut.ac.th/ASEAN.